This is my self-indulgent birthday blog during I reflect on what I really learned during the past year. And this year, I learned more than I did my entire time in high school. But unlike high school, I didn’t receive any grades to indicate whether or not I passed the tests I endured. Instead, all I have to show for my efforts is the realization that being imperfect actually rocks. After spending the early part of my life avoiding anything I was afraid I couldn’t perfect then spending the remainder of my life thinking I’d gotten over that, this year taught me that neither effort was particularly relevant. Life isn’t about our potential for perfection or our ability to avoid it. Instead, it’s about our ability to bring out the best in others. People who are focused on themselves can’t do that. During the past twelve months, I observed people who were so determined to impress others with their knowledge and abilities that they ignored the facts right in front of them. I witnessed people being belittled so other people could indulge in their own need to feel superior. And I experienced the raw grief of witnessing something meaningful being slowly torn down piece by piece because an individual couldn’t admit he was better at talking a good game than actually implementing the plays. Most of all, I realized that if I were perfect, I could have fixed all of that or prevented it from ever happening. Instead, as an imperfect person, all I could do was comfort those who suffered, listen to those who felt ignored and express grief about lost opportunities. And I did all of those things while complaining about other people, constantly sharing my opinions and calling out incompetent individuals with inflated egos. So while trying to do my best, I still revealed my imperfections. But I also learned that striving for perfection is impossible and pretending not to care about falling short is self-indulgent. But imperfect people who simply strive to do their personal best while cheering on others each day really is what life is all about. 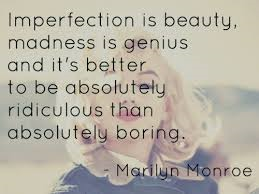 And that is why imperfect people who really do rock. Posted on February 21, 2014, in My life, perspective and tagged aging, birthdays, impefection, life, musings, People, perspective, Thoughts. Bookmark the permalink. Leave a comment.